We are required by law to maintain the privacy of your health information. We are also required to give you this Notice about our privacy practices, our legal duties, and your rights concerning your health information. We must follow the privacy practices that are described in this Notice while it is in effect. This Notice takes effect September 1, 2013, and will remain in effect until we replace it. We may change our privacy practices and the terms of this Notice at any time, provided such changes are permitted by applicable law. We may make the changes in our privacy practices and the new terms of our Notice effective for all health information that we maintain, including health information we created or received before we made the changes. We will post a copy of our notice in our office and on our website www.huismandental.com. You may request a copy of our Notice at any time. Treatment: We may use or disclose your health information to another dentist or healthcare provider providing treatment to you, or if we refer you to another health care provider. Healthcare Operations: We may use and disclose your health information in connection with our healthcare operations. Healthcare operations include quality assessment and improvement activities, reviewing the competence or qualifications of healthcare professionals, evaluating practitioner and provider performance, conducting training programs, accreditation, certification, and licensing or credentialing activities. To Your Family, Friends, and Other Persons Involved in Your Care: We may share with a family member, friend or other person identified by you, your health information that is directly related to that person’s involvement in your care or payment for your care, or to notify such individuals of your location or general condition, but only if you agree that we may do so, or, based on our professional judgment, we determine that you would not object to the disclosure. We will also use our professional judgment and our experience in allowing a person to pick up supplies, x-rays, or other similar forms of health information on your behalf. Use and Disclosure of Health Information Required by Law: We may use and disclose your health information when required by federal or state law; when required in court or administrative proceedings; for public health activities; to health oversight agencies; to coroners, medical examiners, and funeral directors; to the military; to federal officials for lawful intelligence and national security activities; to correctional institutions regarding inmates; to law enforcement officials; to report abuse, neglect, or domestic violence; to avert a serious threat to your health or safety or the health and safety of others; and as authorized by state worker’s compensation laws. Marketing Health-Related Services: We will not use your health information for marketing communications without your written authorization. Will we never sell your protected health information for any reason. We will never use your protected health information for fundraising purposes. Security Breaches: You will receive notification of any breach of your unsecured personal health information per the guidelines of HIPAA and HITECH as outlined by the United States Department of Health and Human Services. Contacting You: We may use and disclose your health information to contact you about appointments and other matters, and to send you billing statements. We may contact you by telephone, email, text message or mail. E-mails will be unencrypted. There is some risk protected health information could be read or accessed by a third party while in transit. We may leave you messages at the telephone number(s) you give us that may contain your protected health information. Health-Related Services: We may use and disclose your health information to send you information by mail or email about our health-related products and services available to you, general dental health news and information, and offers available only to our patients. Upon your request, we will tell you how to cancel these communications. Your Authorization: We may use and disclose your health information for treatment, payment, or health care operations; in certain situations if you agree or object; as required by law; to contact you; and to send you health-related information, but we cannot use or disclose your health information for any other reason without your written authorization. You may give us written authorization to use your health information or to disclose it to anyone for any purpose. If you give us an authorization, you may revoke it in writing at any time. Your revocation will not affect any uses or disclosures already made with your authorization while it was in effect. Right to See and Copy Your Health Information: You have the right to see or get copies (both paper and digital) of your health information, with limited exceptions. If we deny your request due to one of these exceptions, we will respond to you in writing with the reason we cannot grant your request, and describe any rights you may have to request a review of our denial. You must make a written request us to access your health information. Your written request must be signed and dated. We may charge you a fee for expenses such as copies, staff time, and postage. Instead of providing you with a copy of your health information, we may prepare a summary or an explanation of your health information for a fee, if you agree in advance to the form and fee of the summary or explanation. Right to Accounting of Disclosures of Your Health Information: You have the right to receive a list of instances in which we or our business associates disclosed your health information for purposes other than treatment, payment, and healthcare operations, and certain other activities for the last 6 years, but not before April 14, 2003. If you request this accounting more than once in a 12-month period, we may charge you a fee for responding to these additional requests. Right to Request Restriction: You have the right to request that we place additional restrictions on our use or disclosure of your health information, including uses or disclosures for treatment, payment, and health care operations, and to family members, friends, or others involved in your care or payment for your care. You also have the right to request restriction on personal health information disclosures to your health plan for health services or items paid out-of-pocket in full. You must submit a written request that is signed and send it to Huisman Family Dentistry, 397 N. 120th Avenue, Holland, MI 49424. We are not required to agree to these additional restrictions, but if we do we will abide by our agreement (except in certain situations, such as to provide you with emergency treatment). Right to Request Alternative Communication: You have the right to request that we communicate with you about your health information by alternative means or at alternative locations. For example, you can ask that we only contact you at work, or only by mail. You must make your request in writing and your request must be signed and dated. Your request must specify the ways in which you wish to be contacted. You do not need to tell us the reason for your request. Your request must be submitted to Huisman Family Dentistry, 397 N. 120th Avenue, Holland, MI 49424. Right to Request Amendment: You have the right to request that we amend your health information. You must submit a written request that is signed and dated. Your request must explain why your health information should be amended. 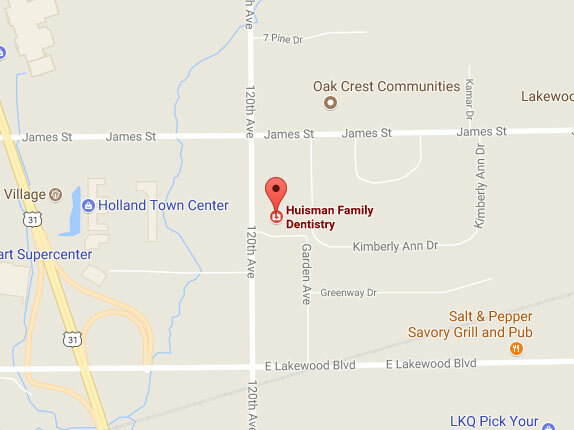 Your request must be submitted to Huisman Family Dentistry, 397 N. 120th Avenue, Holland, MI 49424. The right to receive this information is subject to certain exceptions, restrictions and limitations. If you want more information about our privacy practices or have questions or concerns, please contact us at Huisman Family Dentistry, 397 N. 120th Avenue, Holland, MI 49424. If you are concerned that we may have violated your privacy rights, you may submit a written complaint to the U.S. Department of Health and Human Services. We support your right to the privacy of your health information. We will not retaliate in any way if you choose to file a complaint with us or with the U.S. Department of Health and Human Services.